We invite you to watch a rare performance by Madhavi Mudgal and her troupe to raise funds for the American India Foundation’s (AIF) Uttarakhand Relief Fund in partnership with the United Mandal of America (UMA), created to help rebuild and heal communities destroyed by the recent Himalayan tsunami and resulting devastating floods. The Fund will specifically support families who have lost their homes, businesses, or their primary income earner through a series of interlocking rehabilitation interventions. Click here to learn more about the AIF Uttarakhand Relief Fund. 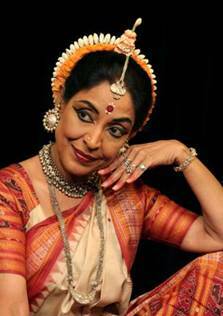 Madhavi Mudgal is a leading expert of the Odissi form of Classical Indian dance. She learnt her art under legendary Guru Kelucharan Mohapatra, and is credited with bringing a greatly refined sensibility to her art form. Vistaar: Rhythm and Melody of the primal and ever expanding core expressed through the graceful vocabulary of Odissi dance. In this choreography, Madhavi uses the basic time cycle as the foundation upon which multiple variations of rhythm, movement and spatial structures are generated.